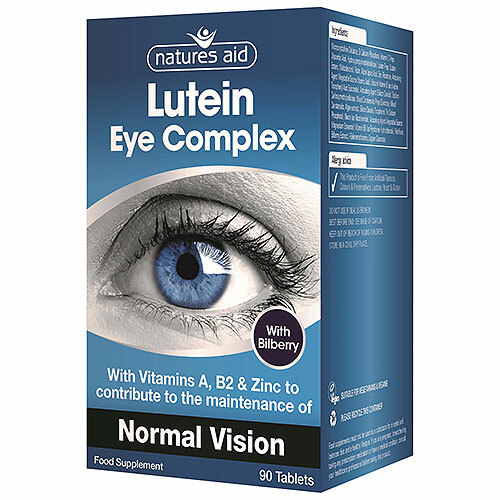 Natures Aid Lutein Eye Complex contains Bilberry, Vitamins A, B2 (Riboflavin) and Zinc which contribute to the maintenance of normal vision. Microcrystalline Cellulose, Di Calcium Phosphate, Vitamin C Prep, (Ascorbic Acid, Hydroxypropylmethylcellulose), Lutein Prep, (Lutein Esters, Maltodextrin), Rutin, Alpha Lipoic Acid, Zinc Picolinate, Anticaking Agent (Vegetable Source Stearic Acid), Natural Vitamin E (as d-alpha Tocopheryl Acid Succinate), Anticaking Agent (Silicon Dioxide), Sodium Carboxymethylcellulose, Mixed Carotenoids Prep (Dextrose, Mixed Carotenoids, Algae Extract, Silicon Dioxide, Tocopherol, Tri Calcium Phosphate), Niacin (as Nicotinamide), Anticaking Agent (Vegetable Source Magnesium Stearate), Vitamin B6 (as Pyridoxine Hydrochloride), Riboflavin, Bilberry Extract, L-Selenomethionine, Copper Gluconate. 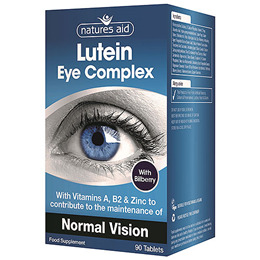 Below are reviews of Natures Aid Lutein Eye Complex - Bilberry - 90 Tablets by bodykind customers. If you have tried this product we'd love to hear what you think so please leave a review.